What’s interesting to me is the fact that intuitives know that they are different from most people around them because they are the minority of personality types. 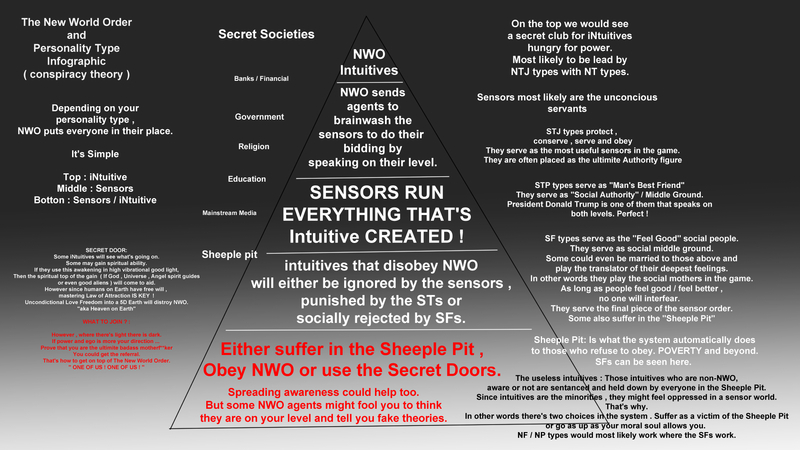 My theory is that the secret societies could possibly be an exclusive NTJs club for NTJs who use power to their own advantage. Of course not everyone of these types listed in the infographic are going to be associated with the NWO , but this is just the theory that perhaps personality science might be used in the workings of the NWO. MBTI is used mostly to help people with career paths and even college resource centers. coincidence ? Who knows if the secret societies want you to take a personality test of some sort as part of initiation. Numerology as well as enneagram . If you took a look to see which types earn the most money , they would point to ENTJ / NTJ. So who are the richest people in the world ? The people on top of the NWO of course ! From a personality prospective , it’s quite a genius design. It's a little tedious but you did say it is a work in progress. I use the SECRET DOOR, as I will NOT follow anything NWO related. Thank you. Yeah it's a rough draft and it does need to be organized more , I just wanted to get the general idea out there . Most intuitives in the MBTI online community do feel that it's a sensor ran world and would think the authoritative STJ types would be the leaders of the Law & Order everything. But then I read and was inspired by Quinton's article here https://www.truthcontrol.com/articles/most-people-cant-put-pieces-togeth... . And that got me wondering just why are intuitives on top ? I could see NFs being more of the social justice warriors and NPs on the Anarchist side of things. But then again I'm an INFP so I only know for sure on the NF side of the street. But like I mentioned it's not to say that ALL types would join the NWO , but the interesting thing is if an opportunity were to come up would an NT / NTJ type take it say if they weren't aware of the NWO ? It depends on how healthy the type is I think. One of the things I'm starting to realize currently relating to the "Secret Door" is if we all take a look at the big picture , it's in the matter of questioning why certain things exist on Earth at all ? I'm into New Thought / New Age Spirituality so I wonder with 5D energy / ( * Living in ONLY positive emotions * ) if we all believed the spiritual power of good unseen forces perhaps we wouldn't need all the 3D vibrational ( aka logical realistic ) things we have today. Almost like creating a Heaven on Earth sort of speak. Greg from in5D.com mentioned this as well as a lightworker video I seen once. So spiritual power is possible . However the biggest question is for Law of Attraction is it just the one person can only create their own lives only and influence is the only thing they can do and with the power of free will people have the freedom of what they can choose. Or perhaps it's not our duty to do anything but to have a happy life. Then again what about lightworkers. This has been something that me and Quinton were chatting about a bit on Slayerment. On one hand there's something that The Secret and Abraham Hicks say which is the top New Thought teachers and then New Thought is indeed a part of New Age which gets into lightworkers , star seeds , Twin Flames , and even NWO. Since Earth life is the only life that we are most familiar with ( unless of course one has gone through a spiritual awakening talking with guides and is a lightworker ) , and according to some types some are more grounded to Earth than others sort of speak. But perhaps that's why we are all on Earth not only to enjoy but our souls to learn. I read before that most if not all people are reincarnated ( if they recognize it ) because there's probably something they didn't learn in their past lives. And with personality science , showing that there's an easily countable amount of personality types , it sort of dispels the myth that there's no way to track down the human populations personality as if there's billions instead of 16 or under. But according to my current research , if happiness ( the high vibrations ) all it takes to live a happy life , all it takes to get Law of Attraction working for us in our live , then there's the 5D Earth ! Therefore people would less and less have no more negative emotions and no more need for something like the NWO to be co-dependent on. Is something like Libertarian Socialist Anarchism a possibility , I don't know. Perhaps a free society without any rules what so ever. The point is people set societal rules and anything as a protection of the bad things in life but if a Heaven on Earth is indeed spiritually possible , it'll all be Utopia. The only difference between Heaven on Earth vs where someone goes when they die , I see afterlife now more abstract because the only limitations left is Earth limitations like the scientific law of gravity and animal instincts . I forgot to recommend the David Hawkins scale of consciousness. According to my spirit guides , I hear that Earth is made of both the high vibrational energy and low vibrational energy and because of free will people can choose which direction of their fate. One thing I keep hearing is even though we have free will it's like a lightworker mission to help the collective sort of speak. It's almost like if spirits are made of pure light and high vibrational energy then why can't they just say in a Heaven and instead sent to Earth to reinvent the wheel , like personal growth and spiritual growth , perhaps it's soul growth and that tyes into the reincarnations. Also the definition of angels and Heaven is rewritten in the religious books in a way for the mainstream to fully get it , but from what I've heard angels are basically non-incarnated human souls and they are made of light. That's also what determines a healthy person from an unhealthy person and why happy feels so good because souls are made of that light. And perhaps souls if unintentionally influence or intentionally influence , we are all here for a reason which relates to the meaning of life and why we are all here. :) And why evil in the world exists is souls who got tangled up by dark low vibrational energy. I like everything you're saying and agree with most of it. A pattern I often see again and again is just how Anarchists are somewhat saying the same thing as those who are aware of the NWO , which is simply that hierarchy causes problems. The Anarchist FAQ points out that when you have hierarchy , you either have submissive or authoritarian attitudes towards authority. People who know of New Age / New Thought spirituality have a general idea which are blockages of body , mind and soul which we picked up through our life on earth which Karma effects our Ego and self esteem. It pretty much gives out the same idea. As I probably pointed out when I made the infographic draft / general idea infographic basically , it's not saying that there's such a thing as an evil personality , far from it , I think it was generally pointing out a similar idea of MBTI personality type and it's relation to hierarchy . Or at least from my thought when I made it. However of course not all types are like that , and it really depends on the individual's experience in life as well as how aware they are or ignorant of what's really going on . The more challenging an individual's life is and the more they are in the victimized state which binds the body , mind and soul , the logical manifestation would be EGO due to fear energy. When it comes to the duality of Good vs Evil , in my opinion " Love vs Fear " is probably better words that describe the idea much more clearer and therefore " Soul vs Ego " . If people were free ( body , mind and soul ) then people won't need to be in conflict because they'd be too busy enjoying their own lives to even bother. I think that's the thing about politics. Some ruler / master / leader can tie the shoelaces underneath the table while they sneak off to do something diabolical and know one will ever know because the conflict is the distraction.